On page 3130, Cherkassky et al. demonstrate that CAR T cells with intrinsic checkpoint blockade mediated by expression of a dominant negative PD-1 receptor improve effector function and overall survival. The cover image is a false-colored electron micrograph of CAR T cells (blue) attacking and killing cancer cells (magenta). Citation Information: J Clin Invest. 2016;126(8):2792-2794. https://doi.org/10.1172/JCI89137. Pregnant women with antiphospholipid syndrome (APS) are at a high risk of obstetrical complications. The current standard of care, including the use of low-dose aspirin and heparin, has not been shown to prevent preeclampsia or intrauterine growth restriction (IUGR). Due to the similarities in pathophysiology among preeclampsia, IUGR, and atherosclerotic cardiovascular disease, statins have been proposed for treating and/or preventing these obstetrical complications. 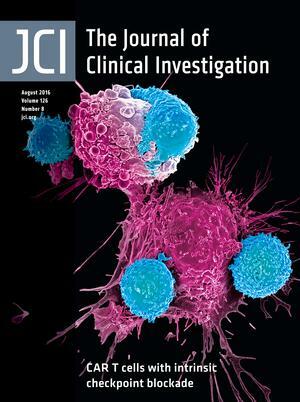 In this issue of the JCI, Lefkou et al. report on a small, observational trial that showed a dramatic improvement in both maternal and fetal/neonatal outcomes in women with APS given pravastatin after the onset of preeclampsia and/or IUGR compared with women in the control group. These results, along with other recent clinical studies, support further evaluation of statins for prevention of preeclampsia in a large-scale randomized clinical trial. Citation Information: J Clin Invest. 2016;126(8):2839-2854. https://doi.org/10.1172/JCI86080. The chronic inflammatory state that accompanies obesity is a major contributor to insulin resistance and other dysfunctional adaptations in adipose tissue. Cellular and secreted factors promote the inflammatory milieu of obesity, but the transcriptional pathways that drive these processes are not well described. Although the canonical inflammatory transcription factor NF-κB is considered to be the major driver of adipocyte inflammation, members of the interferon regulatory factor (IRF) family may also play a role in this process. Here, we determined that IRF3 expression is upregulated in the adipocytes of obese mice and humans. Signaling through TLR3 and TLR4, which lie upstream of IRF3, induced insulin resistance in murine adipocytes, while IRF3 knockdown prevented insulin resistance. Furthermore, improved insulin sensitivity in IRF3-deficient mice was associated with reductions in intra-adipose and systemic inflammation in the high fat–fed state, enhanced browning of subcutaneous fat, and increased adipose expression of GLUT4. Taken together, the data indicate that IRF3 is a major transcriptional regulator of adipose inflammation and is involved in maintaining systemic glucose and energy homeostasis. Citation Information: J Clin Invest. 2016;126(8):2881-2892. https://doi.org/10.1172/JCI82890. The structural maintenance of chromosomes (SMC) family of proteins supports mitotic proliferation, meiosis, and DNA repair to control genomic stability. Impairments in chromosome maintenance are linked to rare chromosome breakage disorders. Here, we have identified a chromosome breakage syndrome associated with severe lung disease in early childhood. Four children from two unrelated kindreds died of severe pulmonary disease during infancy following viral pneumonia with evidence of combined T and B cell immunodeficiency. Whole exome sequencing revealed biallelic missense mutations in the NSMCE3 (also known as NDNL2) gene, which encodes a subunit of the SMC5/6 complex that is essential for DNA damage response and chromosome segregation. The NSMCE3 mutations disrupted interactions within the SMC5/6 complex, leading to destabilization of the complex. Patient cells showed chromosome rearrangements, micronuclei, sensitivity to replication stress and DNA damage, and defective homologous recombination. This work associates missense mutations in NSMCE3 with an autosomal recessive chromosome breakage syndrome that leads to defective T and B cell function and acute respiratory distress syndrome in early childhood. Citation Information: J Clin Invest. 2016;126(8):3006-3022. https://doi.org/10.1172/JCI84767. Citation Information: J Clin Invest. 2016;126(8):3063-3079. https://doi.org/10.1172/JCI85328. Citation Information: J Clin Invest. 2016;126(8):3089-3103. https://doi.org/10.1172/JCI83404.